Su-news.ru is the PUP that uses misleading techniques to prevent removal. Use Reimage to locate malicious components and get rid of them faster than with uninstall instructions. A full system scan blocks virus reappearance and prevents traffic to malicious domains. 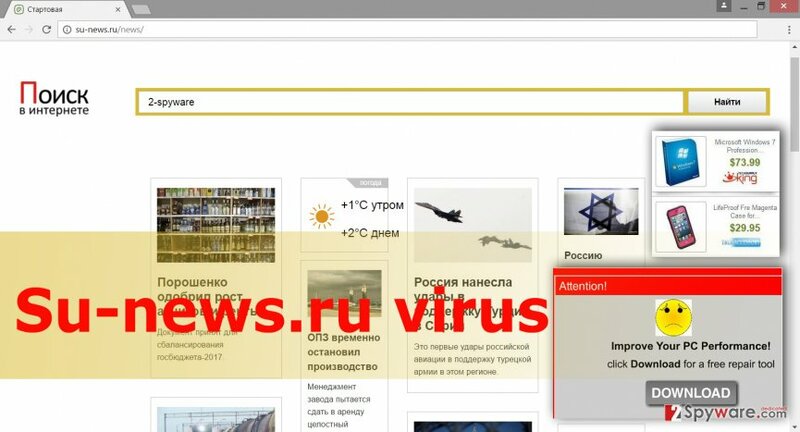 Su-news.ru virus mostly targets Russian-speaking computer users and adds its domain as affected browser’s homepage and default search engine. The main page of this suspicious Russian Internet site includes the latest news, weather forecast box, and the search bar. However, using it is not recommended. Not only these links might redirect to unknown and untrustworthy websites, but also this search engine delivers modified search results. After Su-news.ru hijack, you might also notice an increased amount of ads popping up on each website you visit. Aggressive, misleading and eye-catching ads reduces browsing quality significantly and might put you at risk. These ads might include computer infections or redirect to the infected websites, so it’s important to stay away from great shopping deals, suggestions to install suspicious PC optimizers or bogus antivirus programs, and other commercial content. Apart from ads, your online activities might be disturbed by unexpected redirects to the promotional websites or Su-news.ru/ways site. Redirects might occur suddenly on when you click on URL bar to type the necessary address or any content provided on the main page. Generally speaking, browser hijacker is an advertising tool that helps to increase traffic to the particular websites, boost sales, and sometimes infect computers with viruses. Even though this potentially unwanted program is not dangerous itself, Su-news.ru redirect tendencies might end up badly due to the third-party content. Potentially dangerous content might be placed between search results. Su-news.ru virus may modify organic search results and trick users into clicking on irrelevant sponsored links. As you may already realize, irrelevant and inaccurate search results is the least problem. Therefore, unexpected appearance of this website is the sign that you should scan the PC with reputable malware removal program like Reimage. The anti-malware program will scan your device, remove Su-news.ru and other PUPs that might have been secretly installed as well. The capability of installing other applications or browser extensions without users’ knowledge is another unpleasant feature of this computer infection. These additional components might spy on browsing activity, track data, continue providing ads and protect hijacker from quick and simple removal. However, Su-news.ru removal should be initiated immediately. Therefore, if you got infected with the hijacker, go straight to the end of this article and check the elimination guidelines. Potentially unwanted programs cannot infiltrate computer’s system themselves. They need assistance from other software and user’s permission to enter the system. Therefore, PUPs are added to the software packages as additional components. When users install new programs using “Standard” or “Recommended” setup, they agree to install additional applications as well. Indeed, most of the time users have no idea about it. If you want to avoid Su-news.ru browser hijacker or other similar applications, you should install new programs using “Advanced” or “Custom” installation mode. It allows monitoring the installation process. You might see the list with pre-selected apps that are suggested for you. However, you should not consider their usefulness; deselect them and block their entrance to the PC. Besides, you might also notice the statement where you asked to agree to make Su-news.ru as your homepage or/and default search engine. It goes without saying that you should not let this happen. Deselect this statement as well. If you want to remove Su-news.ru quickly and forget about redirects, suspicious ads, and links, we recommend automatic elimination method. It requires scanning the device with up-to-date antivirus or anti-malware program. Your chosen software will detect all suspicious files and components and remove browser hijacker for you. However, some computer users do not prefer installing any programs and want initiate Su-news.ru removal manually. For those, we have prepared instructions at the end of the article. Follow them carefully. Don’t forget to uninstall all suspicious extensions from all web browsers and reset their settings. Follow the instructions carefully and remove Su-news.ru virus as shown below. Don’t forget that you have to remove not only browser hijacker but all components that might be related to it. Here, look for Su-news.ru or any other recently installed suspicious programs. If you got infected with Su-news.ru hijacker, follow the instructions and get rid of it. Then, check your web browsers and remove all suspicious applications from there too. Wait until you see Applications folder and look for Su-news.ru or any other suspicious programs on it. Now right click on every of such entries and select Move to Trash. Browser hijacker might have installed unknown add-ons without your knowledge. Remove them and restore Internet Explorer’s settings as shown below. When in the new window, check Delete personal settings and select Reset again to complete Su-news.ru removal. Make sure that Su-news.ru virus hasn’t installed suspicious extensions to your browser. Clean your browser as shown in the instructions below. Once these steps are finished, Su-news.ru should be removed from your Microsoft Edge browser. After virus elimination, you should check recently installed extensions. There you might find some apps that are related to the Su-news.ru browser hijacker. Uninstall them and reset Firefox settings. Here, select Su-news.ru and other questionable plugins. Click Remove to delete these entries. Now you will see Reset Firefox to its default state message with Reset Firefox button. Click this button for several times and complete Su-news.ru removal. Look through the list of extensions and uninstall all suspicious entries that might be related to Su-news.ru virus. Here, select Su-news.ru and other malicious plugins and select trash icon to delete these entries. Click Reset to confirm this action and complete Su-news.ru removal. Follow the step-by-step guide and fix Safari browser as shown below. 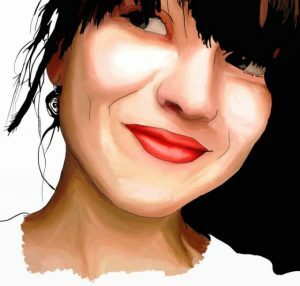 Here, select Extensions and look for Su-news.ru or other suspicious entries. Click on the Uninstall button to get rid each of them. Here, look at the Homepage field. If it was altered by Su-news.ru, remove unwanted link and enter the one that you want to use for your searches. Remember to include the "http://" before typing in the address of the page. Now you will see a detailed dialog window filled with reset options. All of those options are usually checked, but you can specify which of them you want to reset. Click the Reset button to complete Su-news.ru removal process. ^ Browser Hijacking Is The Latest Threat To Cyber Security And Here's How You Can Prevent It. Indian Times. News, lifestyle, entertainment and IT news website. ^ Brian O'Kelley. Malvertising: Three Things You Need To Know. Forbes. Business news and financial news. ^ THE UNINVITED GUEST. A Browser Hijacking Experience, Dissected. Anchor intelligence. Traffic Quality Solutions. ^ Overview: What is a Potentially Unwanted Application (PUA)?. Sophos Community. Discussions and latest information about computer viruses. ^ Potentially Unwanted Programs and how to avoid installing PUPs. The Windows Club. Windows 10 Tips, Trics, Help, Support, Downloads and Features. This entry was posted on 2017-01-02 at 01:03 and is filed under Stealing programs, Viruses. You can quickly scan the QR code with your mobile device and have Su-news.ru virus manual removal instructions right in your pocket. How did you remove Su-news.ru virus?